SUMMARY: Medication adherence programs can improve patient care and lower healthcare costs by more effectively managing chronic medication utilization. We wanted to see which populations are in most need of programs to improve medication adherence. Download the executive summary of 2010 Benchmarks in Medication Adherence and Management. 2010 Benchmarks in Improving Medication Adherence provides actionable information from 107 healthcare organizations on their efforts to improve medication adherence and compliance in their populations and the impact that medication therapy management programs are having on adherence levels, medication costs, ER visits, hospital and nursing home admissions, risk of death and other areas of concern. 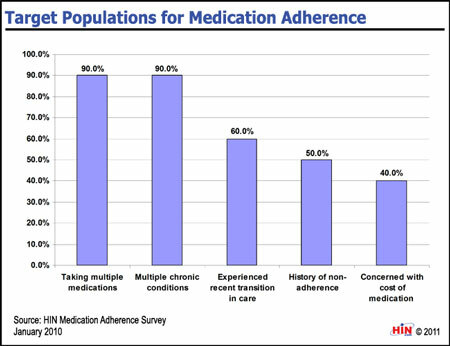 2010 Benchmarks in Improving Medication Adherence is available from the Healthcare Intelligence Network for $127 by visiting our Online Bookstore or by calling toll-free (888) 446-3530.